This has got me craving a bacon sarnie! But i do have to have mine with tomato ketchup. Mmmmm bacon butties… its quite co-incidental as I am going to post today about breakfast & eggs. However, I do love bacon butties once in a while but I have to burn the bacon to a crisp, I cant be doing with chewy bits! p.s we have one of those waving cats too! Bacon butty. Yes, the English bloke turned me on to these and I’ve never looked back. He likes ketchup on his. I think D and I would get along well. I do love a good bacon butty. I was just thinking today I should put bacon on the shopping list! Claire – Look forward to your eggs post! Sophie – Isn’t it! Have to say the way he cooks the bacon is so perfect it doesn’t need anything else. Got the cat – maneki neko – in Japan. Apparently he’s waving in luck/money. Maryann – A roll with egg is called a bomber in Scotland because the yolk explodes when you eat it! I know it is wrong, but I still love the smell of bacon! It would never tempt me though! I love your little kitty behind the plate! Is it Japanese? mmmmmm…bacon butty…I think I may make one immediately. Manhattan has a sad lack of Glasgow rolls – the cretans. Thank you for sharing D’s secrets! I’m reaching into the freezer for some bacon as we speak. Holler – It is Japanese, yes. You see them in the windows of shops everywhere across there. Amanda – Hope you enjoyed that butty! Bread, surely, for a bacon sarnie. And TK, Heinz. Funny how particular we all are about the details … in this house, everyone has to do their own, because everyone likes them just that little bit different. Apart from my husband, who’d always rather eat bacon with fried tomatoes on toast. Strange. I could do that! Beats a bowl of bran flakes hands down! My favorite breakfast is my own, personal Christmas breakfast: one or 2 cups of very hot, very dark chocolate with a plate of Christmas cookies. You can see why it’s only once a year! Next time I go to a restaurant I will have to remember to ask for a Bacon Butty. I get toast and bacon as sides and then make a sandwich of it myself. Great to hear there is an actual name for this! So nice of D to share his tips and techniques. An earthy Sunday breakfast makes you always feel better. Have a nice week Wendy! Oh this sounds so great! That D is quite a chef ! The bake sale and now breakfast! I also do a breakfast sandwich with bun, muffin or toast with bacon and a scrambled egg mixture with cheese, tomatoes, green peppers, garlic and a touch of hot sauce. Sunday mornings are a great thing! Katiez – Sounds great. My own Christmas breakfast is a Bailey’s liqueur on ice! Valli – Love to know what that waitress says! Rose – Thank you! You too. Your breakfast sounds amazing. Not sure I’d be able to eat anything for the rest of the day though! I never knew there was a bacon sandwich – it got all me attention, Wendy! Hard to disagree when it comes to a bacon sarnie – surely a British classic? The only rules I have is make sure it is quality bacon from a good source. I know loads of veggies that secretly eat the odd bacon butty. Bacon seeks them and finds them. We have a great canteen at work. They serve the great bacon sandwiches. I have one every friday morning and it starts my weekend. You can see why I have put a stone on since January when I started there, can’t you! Annemarie – Totally agree! Soggy fat is such a waste. Megan – D is very pleased you think so. Patricia – It’s a VERY popular sandwich in the UK. I would kill for a recipe for Glasgow Morning rolls that I can make fer my wife and weans in Oklahoma. Anybody got one? D has a link to glasgow rolls here but what do you dae with the oil; it doesnae mention. Do you include it in the recipe to help them raise more or what? Douglas – Hello! You use the oil to coat the baking tray. It helps give the rolls that slightly crisp coating. Have to say, neither D nor myself have tried making the Glasgow rolls ourselves. Probably because there’s a shop that sells them riund the corner! Might try them out later this week. Will post if it’s successful. I am now living and working in Indonesia and I miss Glasgow (or just Scottish) morning rolls, especially the well fired ones. The bread out here is far too sweet and not nice to eat. Have tried numerous times to make my own rolls. They taste good just don’t have that same texture as Glasgow Rolls. If there is anyone out there who knows how to make these, please please tell us all???? I just tried my first chip butty this week. I’m vegetarian (well, vegequarian to be exact), but I’ve got some yummy veggie “bacon” and I’m going to try to make the sandwich with that. (They do get nice and crispy, so it should work.) No ketchup, though…yuck. Hmm…is there such a thing as a chip AND bacon butty? Debbs – Don’t know but it sounds good to me! Vegequarian – is that the same as a pescetarian? The only meat you eat is fish and seafood? That is correct. I always used the term pescetarian until I heard the term vegequarian. A friend pointed out that he thought pescetarian sounded like all you ate was fish. LOL I guess vegequarian does sum it up better…you eat veggies and fish/seafood. Actually love Bacon Butty’s, but nothing beats a real Aussie Bacon and Egg roll, with thinly sliced tomato and BBQ sauce. Ian – Bacon AND Egg? Very controversial indeed! Do love a fried egg roll though. We call them bombers up here. I was always a tomato sauce man until i tried it without after reading this. i put plenty butter onto a warmed roll and put in 3 slices of bacon! excelent! nothing says, “i love you” like a bacon roll in the morning! I’m definately going to try making the rolls. Only yesterday my hubby was bemoaning the fact that the ‘Glasgow Rolls’ were nothing like the ones you can buy Glasgow. What have I let myself in for! Here in Sydney, bacon & egg rolls (chips optional) are the hangover cure of choice for everyone over 18. 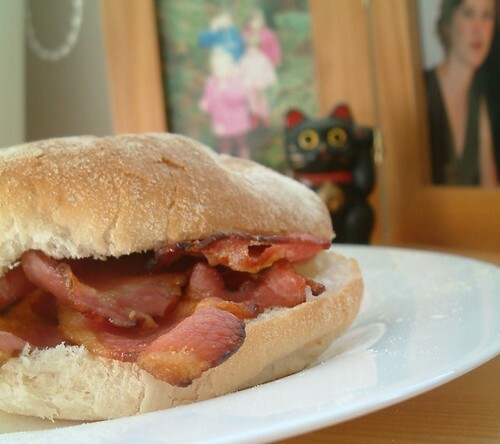 Except me – when I’m hungover, I can’t face anything as high fat & utterly delicious as a bacon sarnie/roll. But I sure am craving one now – even though I too am a vegequarian. Living out here in Sunny California (actually, it’s raining… 2 inches are predicted for the weekend, but that’s half the normal annual amount, so it ain’t all bad), I most miss the crappy, tasty food – Bacon Butties, Sausage Sarnies and Chip Butties. My 5 year old daughter gives me her hot dog buns at the local cafe so that I can make a nice ‘French Fry Sandwich’ but, while I appreciate the love, the lack of proper greasy chip-shop chips and barm cakes always makes me homesick. My wife is going to try your Crispy Duck when she gets a chance… thank you for the trip down gastronomic memory lane. I JUST LOVE ALL COMMENTS ON BACON BUTTIES! I AM TOTALLY, INTO, UNITED KINGDOM COOKING, CUSTOMS, ETC. OHHHH, you have me wanting a bacon sandwich.. mabe i will go make a starter for Ciabatta bread for tomorrow..
Yummmm, I liked my bacon grilled to within an inch from being burnt hate flabby fat on bacon, it’s got to be smoked and I agree no sauce just butter, good in a sandwich too just with white bread of course! I’ve set off on a mission to explore the boundaries of bacon, as well as create the ultimate bacon sandwich (and other classics), and as you might have guessed that’s how I came across your site. Having read your post I can’t help but think D is quite the bacon connoiseur, and I will definitely be testing this recipe and posting the result to my site. I’ve got a quick question, though! I don’t quite know what glasgow rolls are – though I live in edinburgh I’ve never heard of them – but will definitely be baking them following the recipe you linked to. My question is, should the be fresh from the oven or allowed to cool? The one thing that would stop me from turning veggi is the bacon sarnie! What I do different is leave off the butter. Do not drain your bacon. (acts as the butter). Add the bits to the bun. With this you get a more intense bacon flavour.